Even before a stress fracture brought teenage giant Bol Bol’s short, eventful college career to an abrupt end, things have been incredibly bleak for Pac-12 men’s basketball this year. There have been dumb scandals (the dull kind, not the fun kind), disappointments, and most of all, a bunch of sad losses. If a team fails to distinguish itself soon, the self-appointed “conference of champions” could become the first major conference since the tournament expanded to 64 teams in 1984 not to have a single team earn an at-large bid. On the eve of conference play beginning, there are no Pac-12 teams ranked in the AP or Coaches top-25 polls for the first time in seven seasons; Arizona State is the lone squad that even received votes. The Pac-12's two marquee teams, UCLA and Arizona, are both in transition seasons. 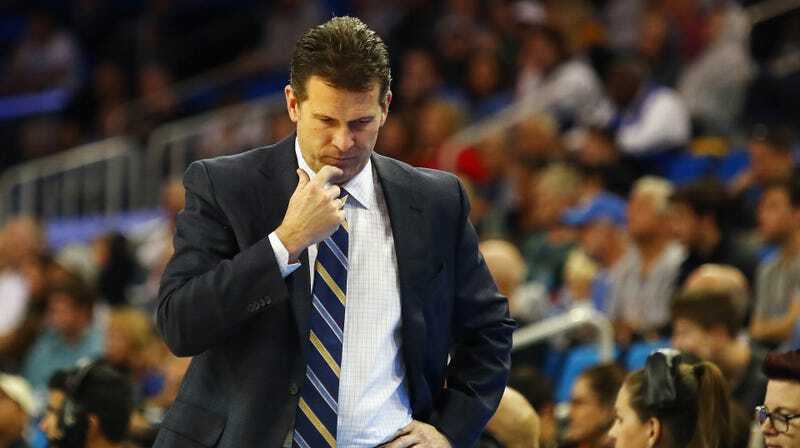 UCLA just fired Steve Alford after a 0-4 stretch capped off by a 15-point home loss to Liberty, and Arizona is dealing with the fallout, in recruiting and otherwise, of the big dumb college basketball money scandal. The conference’s overall record isn’t terrible (92-58), though no team has double-digit wins, and now the best team’s best player will miss all of conference play. The UCLA loss to Liberty is far from an outlier; Cal lost to Yale, Arizona State lost to Princeton at home, and Oregon lost at home to Texas Southern despite being 24-point favorites. The Pac-12 has a combined 7-24 record against other Power-5 schools, and they’re also 7-10 against the West Coast Conference. The Pac-12 went 38-36 in non-conference games in December, good for a winning percentage of .514, the worst month by any major conference in 20 years. Only Oregon and Arizona State crack KenPom’s top 50 (at 39 and 49, respectively), and Oregon will be hard pressed to stay there. The NCAA’s NET ranking system has only the Arizona schools and Washington in the top 75, with the Sun Devils only barely cracking the top 50 despite their win against then-undefeated Kansas. Colorado’s 9-3 record isn’t bad, but they’ve racked it up against one of the easiest schedules in the country. Arizona and Washington missed their shots to get quality non-conference wins, and now they’re out of chances to buff their resumes. What all of this means, practically, is that the 2018-19 Pac-12 men’s basketball season could end with only one team in the NCAA Tournament. That’s never happened before, though the conference is both so deeply unspectacular and so muddled that if Arizona State or Arizona or Washington runs away with the conference title and wins the Pac-12 tournament while the others get stuck in the morass of mediocrity, they might be the lone representative. The Pac-12 already has the ignominious distinction of being the only major conference to send just two teams to the NCAA Tournament, which it’s done four times. Anway, at least Luguentz Dort rules.